The new Mobilis from Louis Moinet is aptly named, with its kaleidoscope dial based on no less than two one-minute flying tourbillons, whose unusual rotation in opposite directions power and thus animate, the kaleidoscope at 12 o’clock. With a patent in place, Mobilis is the first watch with a double tourbillon whose function is to power an automaton in this fashion. How is this done? Well there are two large (14.9mm diametre) light (0.4g) titanium tourbillon cages, one rotating clockwise and the other counter-clockwise. 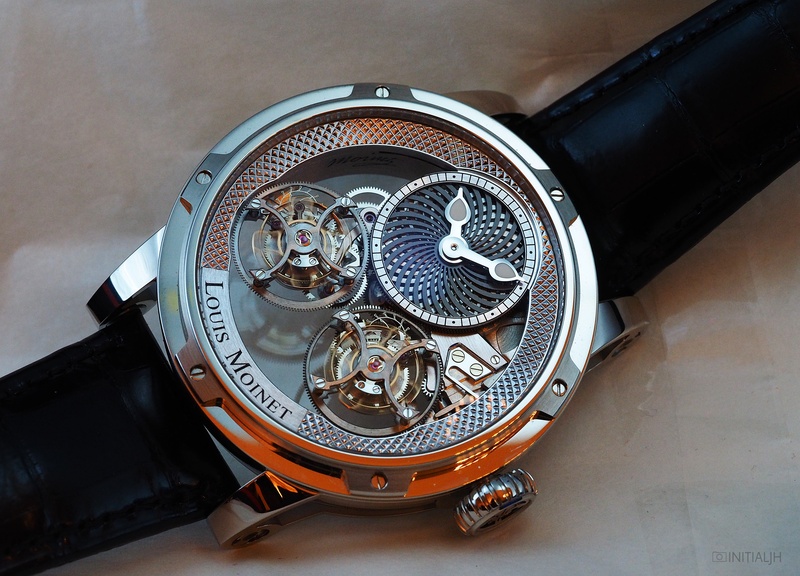 The tourbillons are mounted on ceramic ball bearings. The kaleidoscope itself is animated by two overlapping cut-out discs and driven by an inverted gear system. Inside is the manual-wind Calibre LM-53, made in collaboration with Tec Ebauches SA, which beats at 21,600 VPH and has a power reserve of 52 hours. Coming in a 47.4mm white gold case with open-worked lugs and a bezel with six notches and screws, the side of the case is also characterised by a large fluted crown with the Moinet logo, a heraldic lily. The sapphire crystal is slightly domed. Although in and of itself already a beautifully made timepiece, it’s all about the hypnotic kaleidoscope, which it is quite difficult to take your eyes away from. Available in a limited edition of 12 pieces in white gold, the RRP is 245,000 CHF and it will be available from Spring 2017.